The VO2max test is the criterion measure of aerobic power in athletes. Actual and accurate published scores are difficult to find. The following are just some that are known or have been found through searching online. When comparing to these results, you must consider that the protocols used are probably different, and the accuracy of the results unknown. There is also a list of VO2max World Bests on the sporting records section. The article on VO2max on Wikipedia states that the average young untrained male will have a VO2max of about 3.5 liters/minute or 45 ml/min/kg. at the 2015 NHL Combine, the best score on the VO2max test was 70 ml/kg/min by Matthew Spencer. Brett Deledio, AFL footballer from Richmond, scored 60 ml/kg/min on his VO2max test (Herald Sun Newspaper, 16 April 2009). Sean Wroe, Australian Olympic 400m sprinter, scored 58 ml/kg/min on his VO2max test (Herald Sun Newspaper, 16 April 2009). 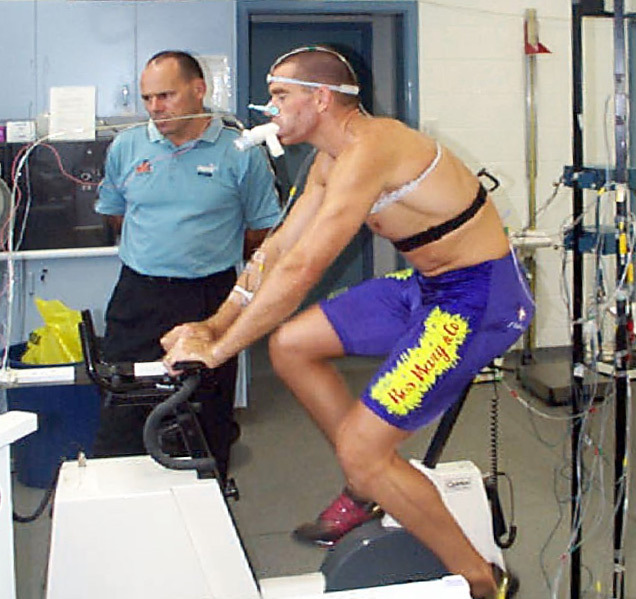 Michael Rodd, Melbourne Cup winning jockey, scored 58 ml/kg/min on his VO2max test (Herald Sun Newspaper, 16 April 2009). Erin Densham, Olympic Triathlete, scored 67 ml/kg/min on her VO2max test (Herald Sun Newspaper, 16 April 2009). Drew Ginn, Australian Olympic rower, scored 67 ml/kg/min on his VO2max test (Herald Sun Newspaper, 16 April 2009). The best score from Øyvind Leonhardsen (Norwegian professional soccer player) was 80.9 ml/kg/min (as listed in an article on www.fasterskier.com, 10 Oct 2005). Chris Froome, two time Tour de France winner, achieved a VO2max 84.6 in a test in August 2015. His weight on the testing day was 69.9kg. He was also tested in 2007 with a maximum oxygen uptake of 80.2 ml/kg/min, at a weight of 75.6 kg (167 lb). Peta Mullens, Australian cyclist, scored 59 ml/kg/min on her VO2max test (Herald Sun Newspaper, 16 April 2009). The best score from Norwegian professional road bicycle racer Thor Hushovd was 86 ml/kg/min (as listed in an article on www.fasterskier.com, 10 Oct 2005). The best score from biathlete Ole Einar Bjœrndalen was 86 ml/kg/min (as listed in an article on www.fasterskier.com, 10 Oct 2005).